Christmas isn’t complete without a tree! Thankfully trees are so versatile you can modify to fit every decor style. 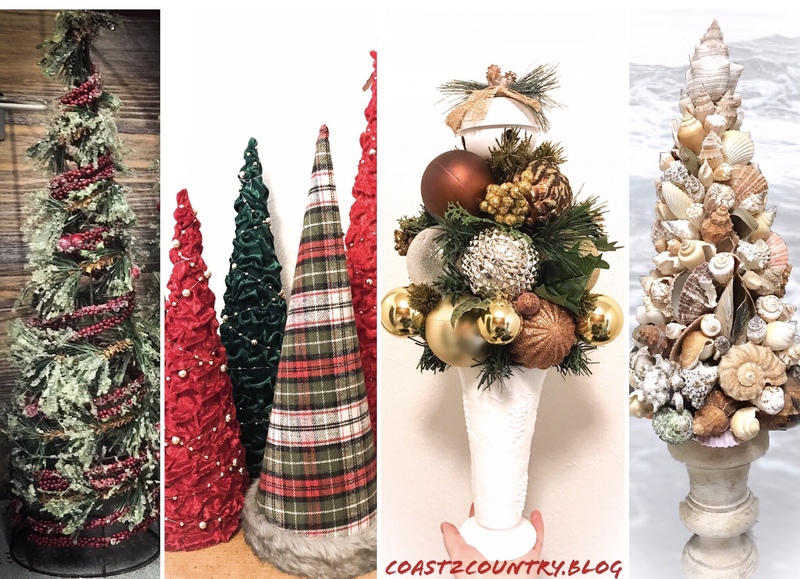 Let’s make your Christmas tree as unique as you! Southwestern, MidMod, Farmhouse, Beach, Minimalist…you name it, you can create it! Here are a few examples. Customize your Christmas trees to fit your space & decor style. You can really let your imagination soar when creating ornament trees. This is a great place to use your left over ornaments or past color palettes. First choose your base. Flower pot, vase, decorative cookie jar? Hot glue ball ornaments around the cone. Add greenery and smaller ornaments to fill in gaps between ornament balls. Add a tree topper, ribbon or bow! Do you live on the coast? Or just live like you do? This is the perfect project for you. Use your favorite shells to create a beautiful shell tree. It will surely be the highlight of your Holiday collection. Hint: Use an old candlestick, banister or planter as your base! This tomato cage tree is so easy and great for decorating indoors or out! These were seen at Michaels but can be easily reproduced. Simply take your tomato Cage and flip it upside down. Join the four stakes at the top together with wire or a rubber band. Get creative! Use wired ribbon, garland or greenery to wrap around the cage! Cone Trees are a great place to use your scrap fabric & trim. I keep all of my scraps for occasions just like this. Simply roll a piece of card stock into a cone & hot glue in place. Cut a square of fabric the appropriate size or use smaller fabric scraps & trim to cover. Add lace, fur or ribbon at the base for added interest. I love cactus and succulents but each winter I have to bring them inside. This makes for unexpected decor opportunities. Usually I try to tuck them away out of sight but instead I embraced the Christmas cactus trend this year. Start with your favorite cactus. Taller the better. They make great imitation cactus as well! I’m using my cactus candelabra tree. Wrap loosely with garland or battery powered lights. A few ornaments go a long way. you have so many options when decorating the base. Wrap your pot with wrapping paper, Add a Tree skirt, Or use a simple bow! What have you used for an unconventional Christmas tree?